If you're unfamiliar with NXT, it's WWE's developmental territory in Florida, and features talent waiting to get the call up to the main roster a well as more established talent. The latest talent to emerge from the show on WWE television has include all three members of the Shield, current NXT Champion Big E Langston and Royal Rumble entrant Big E Langston. This weeks saw the return of Brit William Regal to ring as he faced Kassius Ohno (formerly Chris Hero) after the two have been having quite the rivalry as of late. Firsty, it's great to see William Regal back in the ring, he's always been one of my favorites to watch in the ring as well as listening to on the mic. Personally I think he was one of the most misused talents in WWE, where he became something of a joke at points during his career, including as Kassius Ohno pointed out kissing Vince McMahon's backside live on Raw. Despite some silly storylines you can always count on Regal to perform in the ring. The match was a very enjoyable encounter between two talented competitors at either end of their career. It's interesting to see Regal playing the face in this match after spending most of his career as a dastardly villain, although Regal really hasn't changed his character that much, something which some WWE talent should take note of. Kassius works his role as student turning on teacher well throughout the match, as he has done since joining NXT. Regal controlled most of the match, focussing mainly on the fingers of Ohno, bending them back, which made for uncomfortable viewing, especially when the camera showing Ohno putting his dislocated fingers back into the socket. The offence from Ohno focussed mainly on Regal's head, who looked off balance during parts of the match, including a nice two footed dive through the middle rope to the outside, as well as a big boot to Regal's head as it was propped against the ring post. Regal won the match clean after Ohno missed with his KO and Regal hit the Knee Trembler. Hopefully this isn't the last we see between these two competitors as it feels like this rivalry has a lot more to give. Although if Ohno keeps putting in performances like this it can only be a matter of time before he gets called up to the main roster. The opening contest saw Seth Rollins, Dean Ambrose and Roman Reigns collectively known as The Shield take on Percy Watson, Scott Dawson and Axl Keegan. The match was short with the Shield dominating precedings throughout, eventually winning with their Flying Antelope double team on Axl Keegan. It's a shame to see Percy Watson who once looked destined for the main roster in this kind of match, as I had previously enjoyed his performances on the old incarnation of NXT. After the match, The Shield cut another great promo on how they'd run Raw and Smackdown and will forever run NXT. They were interupted by Corey Graves on the titan tron. The Shield had previously cost Graves two shots at the NXT Championship and Graves challenged one member of The Shield to a match next week. Seth Rollins answered the challenge and gave Ambrose and Reigns the night of next week, saying once he was done with Graves he will Believe in The Shield. 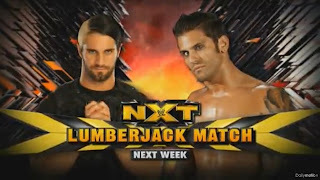 The match was later made a Lumberjack Match by NXT General Manager Dusty Rhodes. It was slightly confusing during this segment as to what roles The Shield and Corey Graves were attempting to play, as both have been, presented as Heel over the past few months. Both the crowd and the wrestlers seemed to feel the same way. There was also Divas action as Cameron & Naomi, The Funkadactyls took on Nikki and Brie, The Bella Twins. The match on the whole was well worked, with Naomi looking especially competent in the ring, it will be interesting to see if she gets another shot at the Divas Championship soon. However there were some moments of awkwardness where the competitors generally looked like they didn't know what was coming up next. We also saw two interviews to continue two ongoing Diva's angles on NXT. Firstly, Tony Dawson interview Summer Rae, who gave the explanation to why she ran away from Paige the previous week as she had left her curling iron on. This worked well for Rae's character and she is really impressing me with her mic work as of late, even if The First Lady of NXT gimmick has been recycled from many other women's wrestlers. The Paige Vs. Summer Rae angle is heating up and it feels like it's only just getting started, take note main roster, if Divas are given stories to tell they can get themselves over with the crowd. Then we had Renee Young interviewing Emma about her dancing, in a silly segment. Unfortunately, neither interviewer or interviewee had any comic timing to pull off what was a pretty awful segment, ending with Emma falling over. For me NXT continues to be one of the most entertaining wrestling shows of the week, the angles feel fresh and exciting and it's always nice to take a breather from the main WWE stories that are occassionally a little heavy handed in their approach. Hopefully we'll get to see Regal and Ohno go at it again very soon. Next Week: Seth Rollins Vs. Corey Graves.